I have only cut out the pieces, but I'm going to start sewing tonight. After I come home from the fabric store. I also signed up for Pink Chalk's Fabric Club. I'll get 8 yards of solids once a month, this first shipment will be in pinks. As I was re-organising my fabric stash I realised I have very little solids or the equivalent of solids (tiny dots, stripes, checks). I guess when I buy fabric from the States I tend to get the prints since space in the shipment is limited. I need to get better about that. So tonight, if the girls aren't too tired, hungry and cranky we're going to the fabric store. I want to get fabric for linings and bodices, I'm getting oilcloth for a coat for Sofia, some acetate lining fabric, some broadcloth, my favourite gingham in several colourways, 2 pillow forms 16" square, zippers and thread. I will try my very best not to get any more printed fabric as I have loads and loads of that at home. I found some cotton heirloom fabric that I think will make a nice dress for Isabel and one for Sofia. They had two patterns and of course I preferred the one that cost almost twice as much as the other. 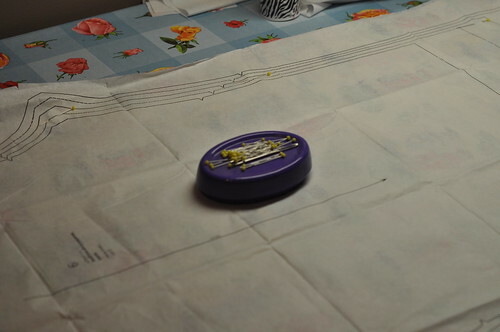 I also plan to get some interfacing to trace pattern pieces on. It will be a lot more durable than tissue paper. I'm not a huge fan of tracing patterns though as it takes so long, but once it's done it will save me time.